It took two months, and a fair amount of drama, but SpaceX finally successfully launched six ORBCOMM Generation 2 (OG2) satellites on Monday. The Falcon 9 v1.1 rocket lifted off from Cape Canaveral at 11:15 am EDT (1515 GMT) and started deploying its payload six OG2 satellites about 15 minutes later. All six satellites, built by Sierra Nevada Corporation, are in their planned low Earth orbits and in good condition, ORBCOMM confirmed in a press release Monday afternoon. ORBCOMM said a second batch of 11 OG2 satellites should launch by the end of the year, also on a Falcon 9. The launch was originally planned for May 10, but was postponed when an issue cropped up during an attempted static test firing. The launch slipped until mid-June, when an issue with one of the six OG2 satellites had an issue that pushed back the launch a week. A technical issue scrubbed a June 20 launch, then weather postponed a June 21 attempt, and another technical issue, coupled with range maintenance, pushed back a June 22 launch until Monday. In the middle of all that, SpaceX kicked up a firestorm of criticism when it announced it would not webcast a June 21 launch. SpaceX did webcast the Monday launch, although it was a more low key affair, starting less than 15 minutes before launch, with primarily audio from launch control with a little commentary. The webcast ended prior to payload separation, although that was consistent with some prior SpaceX webcasts. SpaceX has not announced when the next Falcon 9 launch will take place. According to the manifest on its website, it has two missions coming up for communications satellite operator AsiaSat, who announced in June that the AsiaSat 8 satellite had arrived at the Cape for a planned August launch. 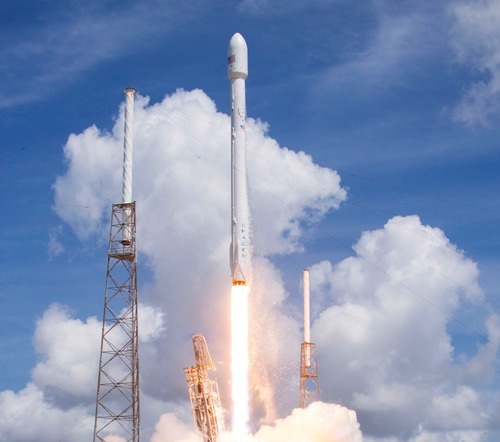 On Sunday, NASA said it had tentatively scheduled SpaceX’s next Dragon cargo mission to the International Space Station, SpaceX-4, for launch no earlier than September 12. I hope SpaceX can (quickly) get its act together with landing the first stage back on firm ground. As far as the “kaboom” is concerned, it seems to me that uber hot rocket motors and cold water wouldn’t mix too well. Just a thought. Personally, I am far more concerned that SpaceX get their launch rate way up. They have had small glitches along the way. All in good time. Obviously their first priority is to get it right everytime, due to being fixed firmly within the middle of the ULA crosshairs. Also, if they can get their stages soft landing back on firm ground, the cost of launching hardware to LEO could conceivably be reduced to well under $1,000 per kilo. That result would be great for all space flight endeavours, especially HSF.